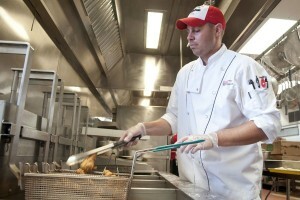 Campus Dining chef Darin Ganci. For one night only, Marketplace at Linkins will be a lot more like Iron Chef’s Kitchen Stadium or the Chopped Kitchen than a traditional campus dining center. Wednesday night is the sixth annual Local Foods Dinner, a special meal co-sponsored by Campus Dining Services and prepared with ingredients found locally by the unit chef. The twist is that Chef Darin Ganci ’01 does not go into the meal with a set menu and is presented with unknown ingredients. While Ganci admits that “it’s not the basket clue on TV,” alluding to the mystery basket that contestants face on Food Network’s Chopped, his challenge will come from trying to create new options. The Herscher native came to Illinois State in 1996. He began working at Watterson Dining Commons as a student, and eventually he followed the organizational leadership sequence with a business management degree. He landed a full-time job with Campus Dining even before graduating when an administrative position opened at Watterson in 2001. This is Ganci’s first opportunity to participate in the Local Foods Dinner, and he’s excited to create a different menu. Darin Ganci started working at Watterson Dining Commons while he was still a student. “I start with one idea or one cuisine, and make the menu around that. I enjoy doing that at home,” Ganci said. But that is not to say that Ganci is not preparing. “I have 75–80 cookbooks, so I’m reading. And I have my experiences,” he said. Although there is some mystery to the ingredients that will be used and the general challenge of not having everything prepped, some of the ingredients are locked in. This year’s dinner will include chicken, beef and goat cheese, in addition to produce and possibly other ingredients from around the area. “I know that we’ll do the chicken on the grill, and I imagine I’ll try to incorporate some Italian because it’s a lot more familiar to students,” Ganci said. Ganci’s passion for students does not stop with the food he creates. “I love working with them. I had a blast in my five years here (as a student). I want kids who work in Campus Dining to feel the same,” he said. Then he added with a laugh, “Although I do have little patience for people who don’t have the same work ethic I do.” This work ethic grew from working in a junkyard prior to attending Illinois State. Some of the local businesses providing food for the event are Bane Family Meats, Prairie Fruits Farm, Bittner’s Meat Company, Troyer Family Gardens, Green Acres Herb Farm, and Crump Family Garden. The event is co-sponsored by Sustainability ISU and UPB. “Anytime we can use local produce, it has a positive effect on the economy and helps small business. And this should be a healthier product because it’s fresh,” Ganci said. The Local Foods Dinner is set for 5:30 p.m. Wednesday, September 4, in the Shawnee Room at Linkins. Tickets are available for purchase at Watterson Dining Commons and at Linkins. Students with meal plans will be charged for one meal; students without meal plans, $12; faculty and staff, $25.